Until we accept that we are powerless, we do not stand a chance. When I first heard this said in the rooms, I honestly thought this meant I was weak and incapable. Although I was beaten down, I still believed that I was in control. I thought maybe I just did not have enough willpower or that the circumstances in my life were what caused me to drink too much. It was that kind of thinking that kept me stuck at step one. Sure, I had gone through the steps a few times in my first few years of sobriety, but had I honestly lived them? Powerlessness is not a sign of weakness. It is pride that keeps us from asking for help when we most need it. Last night, my daughter told me that I need to let my guard down and let others help. This was coming from an 18 year old girl who has more wisdom in her little finger than I had at that age for certain. Out of the mouths of babes. So, today, I am pushing my pride to the wayside in hopes that I will accept help from others, and more importantly, from my Higher Power. 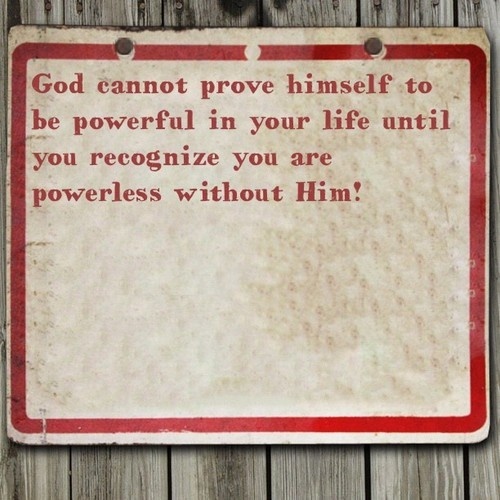 I have learned time and time again that I am powerless… not weak… simply powerless without God in my life. yup – there is a notion that we must fight and battle this thing, when the easiest thing to do is to lay down our weapons (ego) and accept help. Admit and concede to our innermost selves that we heed help. We are broken but repairable. For a drunk like me, fighting got me nowhere, except into more jackpots. This idea that we’re weak by admitting we are powerless has killed more alcoholics and addicts than I can imagine. I know many people who “fight” all the time, and are more often than not beat down by alcohol again and wonder why they can’t will themselves to beat alcoholism. We can’t. Our HP can. We just have to let Him/Her/It do it. I too still have hard times accepting help. But that’s ego working again. Damn ego!